And just like that, another year has come and gone. For many of you, 2013 , just like any other year, had its ups and downs. Hopefully a lot of you experienced more positives and accomplished most of, if not all the goals you set at the top of the year. As we embark on 2014, now is a good time to reflect back on this year and ask yourself some very pertinent questions. Did you get a work out in at least twice a week? How many goals did you have at the top of the year and how many of those did you accomplish? What was your biggest challenge from a health & fitness standpoint? Over my years in fitness, I’ve come the realization that a great way to encourage continued success is being able to review and dissect your efforts from a dietary and fitness perspective. A lot of seasoned fitness enthusiasts can get somewhat complacent after a number of years. Imagine a person who goes to the gym 4 days a week and trains his/her body as intense as possible. After a couple of years, no matter how hard this person continues to push, if there are no goal set in stone, this person could actually have regressed even if the frequency of going to the gym is unchanged. If you continue to squat 100 pounds for 10 reps and run 2 miles every week, how would you know if you’re making progress in those areas? I’ve never been a fan of the so-called ‘New Year’s Resolutions’. I think they’re just another commercial ploy employed by health clubs to take money out of the public’s pockets. It’s also a misleading and deceitful attempt to get a sedentary person to become physically active. But I can see why they work for many people and can be a effective strategy. The beginning of a year is like the start of a book. It’s clean, it’s fresh and unblemished. People like to start out the year on a clean slate and just like their health and fitness goals, they set other goals in their personal lives. 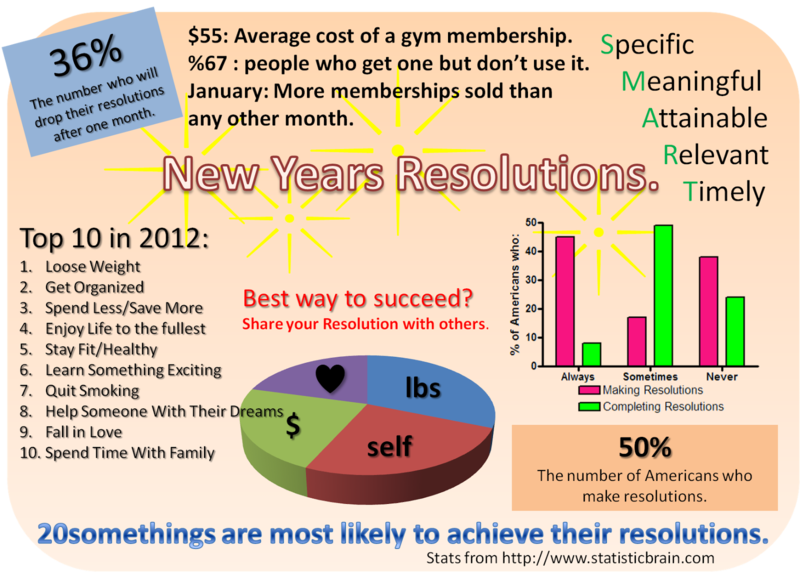 A 2013 Journal of Clinical Psychology study show that only 8% of people who make resolutions successfully achieve them. Also looking at the chart above, courtesy of statisticbrain.com, 36% of people who made resolutions in 2012 dropped them after only a month! In my humble and professional estimation, the reason for these failures is unnecessary and unwanted pressure to succeed and frame of mind. No matter what time of the year it is, the ability to embark on a fitness program is hinged on the state of mind of an individual. There are several stages we all must go through to determine readiness to become physically active. Whether its a scare in our lives or that of a loved one or a doctor’s recommendation or even not being able to play with our kids and grandchildren, something will trigger the need to exercise. More than anything else, mentally is the biggest challenge. At the end of the day, a person has to look in the mirror and say, “It’s time”. No doctor or personal trainer or even the commercial marketability of New Year’s Resolution will have a stronger impact than the mental aspect. 2. Find a way to challenge your workouts every week or month. Cutting down your rest period between sets by 30 seconds, adding an additional set and trying a new routine are simple ways to achieve this feat. 3. Dietary speaking, look up a new healthy meal and its recipe and include that to your daily and weekly meals. I’m still surprised how much money I save from cooking my meals as opposed to buying and ordering. 4. Prepare and plan your meals ahead of time. I find this to be the single most challenging aspect of eating healthy. Many of us, myself included, wait until the morning of each day to decide on what we’ll eat that day. This can sometimes lead to bad habits like not getting enough meals or eating the wrong meal. I try to plan my meals ahead most days of the week. It can be a very daunting task but it is very gratifying and worth the effort. 5. Read a book, attend a class or watch a documentary on a health and fitness related topic. You don’t have to be a fitness professional to do these things. You will learn so much about yourself, your workouts and diet just by reading books, journals and even watching YouTube clips on fitness and diet. Even after almost 10 years as a fitness enthusiast and certified personal trainer, my passion for learning more has not changed. In fact it is stronger today. I wish you all a happy and healthy 2014! This entry was posted in Fitness and tagged New Year Resolution, SMART criteria. Bookmark the permalink.